This patented tool cuts wire with one end and strips wire with the other end. The stripper self-adjusts to wire size as one prong holds while the other catches and strips wire in one quick motion. It is spring loaded to reduce fatigue and is designed for hundreds for wire strips. The cutter makes low profile full-flush cut. Whether stripping wire or cutting wire, it fits the hand nicely and easily. 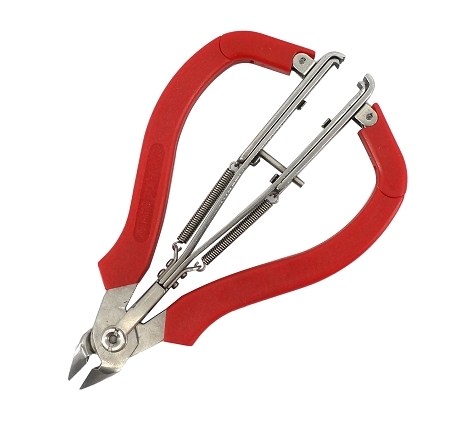 This 5" wire stripper and wire cutter is compact and light weight and makes the job really easy. These combination stripper / cutter is an electrician's choice. The EEX-0313 works very well, cleanly and handily cutting and stripping solid cooper wire, single strand and multi-strand 18-24 AWG. It is exactly what I was looking for in a tool. I use it regularly, no longer having to magnify my wires to look for defects from the process. Thanks ATI for making an excellent tool. One of the handiest gadget I have come across. Even though it says 24-14 gauge, I used it on 28 AWG and it works great. Reliably stripped 28AWG wire.